I was looking at shells to order from Richard's, particularly fluctuosus, and it says the opening is 59/64th which I don't think is accurate. I'm concerned that may be too small. I love Richards! You would need to tell them that the shells are for hermit crabs so that they check them for holes, etc. Do you have a caliper? That is how they measure the shell opening. You can pick up a relatively nice one on amazon for around $8. I personally prefer the digital ones. I have a caliper but I use measuring tape to measure my shell openings. crabby33 wrote: I have a caliper but I use measuring tape to measure my shell openings. A caliper is more accurate at measuring the inside of a shell than measuring tape would be. I was actually hoping to find guidelines for Richard's measurements. I've seen opening sizes for 32/64th and 14/32nd and various other sizes. I'm assuming that's in millimeters? Why are some listed in mm and others in inches? My guess is they’re measuring the length of the shell, not the opening. I prefer to buy from places that measure the opening hole. Like Mygann’s or Naples. They have separate numbers for shell length and shell opening, so it's definitely shell opening. I think those measurements are fractions of an inch, when I think about it some more. It was kind of confusing for a while, I'll be honest haha. But I think that's what I'll go with. Thanks! It is fractions of an inch, units so small that really only carpenters and other professions that need exactness use. It's kind of silly when it comes to hermit crab shells. 1/8 is plenty! wodesorel wrote: It is fractions of an inch, units so small that really only carpenters and other professions that need exactness use. 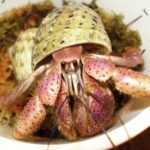 It's kind of silly when it comes to hermit crab shells. 1/8 is plenty! We build wooden roller coasters and for the structure we generally will only go to between 1/8" and 1/16" for cutting the lumber. Most tape measures only go down to measure to 1/16". A 32nd is half of a 16th. A dime may be around 1/16" thick. Wodesorel is right. Shells for crabs only need to be broken down 1/8". I can't see a crab getting that particular with choosing a shell. Tnguo wrote: I was actually hoping to find guidelines for Richard's measurements. I've seen opening sizes for 32/64th and 14/32nd and various other sizes. I'm assuming that's in millimeters? Why are some listed in mm and others in inches? Millimeters do not measure in fractions - its small enough anyway, and anything smaller will require high tech equipment/microscope.... If you want to measure a half (or whatever unit) of the metric system, its commonly accepted to round off or use decimal.